Thai Massage has the advantage of being very versatile since it can be done anywhere without needing much privacy. There is no need to take any clothes off, no massage table is needed and no oil is used. Thai Massage can be used in many ways – professionally, socially or as part of yoga teaching and practice. Here is a list of ten ways and opportunities how this fascinating healing art can be used. 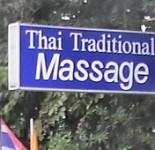 You can “hang out your shingle” as a professional Thai Massage therapist . Now you are working for yourself in private practice. This is the most pleasant way of working since you can pick and choose your clients. You have more time to get to know people, you can easily network with them, schedule more appointments, and get them to recommend you to their friends. You can be more creative with your treatments, since you are not constrained by rules or strict time frames. You also make potentially more money since you don’t have to split it with anyone like if you work for someone else. The disadvantage is that you have to find your clients yourself. You have to be your own marketing agent. If you are not good at marketing yourself, your career can be stressful if not enough money is coming in. This allows you to scale your business by having other therapists work for you. In this way it is not only your time which you are exchanging for dollars, but you also profit from the work that the other therapists are doing. As a business owner the money still comes in even if you yourself are not working, but you will have plenty of other obligations such as taxes, insurances, hiring the right therapists, dealing with therapists who do not live up to your expectations, shop maintenance, cleaning, laundry etc. As a massage business owner your income is not limited anymore, but you will need to do many other tasks which have little to do with massage. If you don’t like doing those non massage jobs, then this might not be for you. This might be a massage business, a spa or a hotel or even a Chiropractor. Here the advantage is that you don’t have to find your clients nor do much marketing yourself, if any. All you have to do is the actual massage work. The disadvantage is that you don’t have much room for creativity, you have to follow the rules of the place if you like them or not, and you have little opportunity to establish ongoing personal relationships with your clients. You have to split your money with the establishment, so you will earn much less per hour than in private practice. This can be made up by the volume of clients though. Many spas work with freelance therapists who can offer something to their clientele which they cannot offer with their regular staff. So if you have a specialty, something unique, something that complements the spa’s offerings, you can work as a “consultant” or “visiting practitioner” for days or weeks. If you are able to travel, this can lead to gigs in some pretty exotic places. A unique skill or specialty which the spa cannot find locally. Some way for the spa to check on you, like a website, recommendations, certifications, work history in other spas, well established social media presence or other accomplishments of yours that can be verified. There are two ways of working for a spa. One is as an employee, and the other way is as a short term contractor or what’s called a “visiting consultant” or “visiting practitioner”. These can make a lot more money, sometimes several times as much as the employees, however the income is not guaranteed. How many other consultants are working there during the time when you are there? If there are 4 other consultants offering their treatments along with yours, there might just be too much competition resulting in little work. Who is paying for transportation, accommodation, food? You or the spa? Can you use the spa facilities? If so, is it free for you or not? Generally employees are not allowed to use them, but consultants are often in a different category. If you are not allowed to use any, you might be sitting in a golden cage, and the whole experience might become boring quickly. What is their tipping policy? How much money do consultants make on average? I have seen consultants making insane amounts of money in high end spas, and I have also seen other consultants fly halfway around the world at their expense, only to sit around for a few weeks with almost no work. So do your research. How do you go about finding such opportunities? Your best bet are high end destination spas like Six Senses or Anantara for example. Especially those who have many international locations are great. Once you get your foot in the door, you might be able to work for a while in Thailand, then in the Maldives, and next in India, for example. Destination spas will generally be the most lucrative or best paying opportunities since such spas attract mostly well-to-do clients who can afford to pay top dollars for massage therapy. Then there are family oriented vacation spa chains like ClubMed. Spas are expanding all over the world and there are lots of opportunities. Six Senses promotes “Visiting spa practitioners” right on top of their home page. What exactly is a destination spa? In case you are not clear about the difference between spas and destination spas: a regular spa might be just part of a hotel. Guests don’t go there mainly for the spa. It is just an extra service which is available. Or the spa might be just a day facility without overnight accommodation. A destination spa however IS the experience itself. People go there specifically for the spa experience, and they often spend their entire vacation in such a place. They don’t use the spa as a base for their excursions as in a hotel, but they go there mainly for the spa services which generally include a wide range of wellness services. There are some destination spas which are like small cities in themselves and guests hardly ever venture outside of the compound. Everything is provided inside. In some of those spas guests spend most of the day going from treatment to treatment. Guests don’t just go there for enjoyment. Often they are looking to lose weight, improve their health, and even cure diseases. I have seen destination spas with more treatment rooms than guest rooms. When you contact such a spa, make sure to find out who is the decision maker, who actually hires therapists as either employees or consultants. It is not easy to get your foot in the door the first time, but if you do, there can be amazing opportunities. I have personally worked as a visiting consultant in stunningly beautiful spas where accommodation and food was free, I could use the spa facilities, and I got paid very well. So it is possible. However just a basic Thai Massage education won’t get you into the door. You will have to have specialized skills, such as we teach in our video training courses at Thai Healing Massage Academy. Thai Massage is becoming more and more popular all over the world. You can offer training either to massage establishments like hotels or spas, or you can offer workshops or courses on your own. This is the route which I have chosen. After teaching live courses for many years, I decided to specialize in high quality online Thai Massage video training courses for home study. As an example, one of our students went on to be become the main Thai Massage instructor for all the therapists at the spa where she had been working for many years. The spa wanted all of them to learn Thai Massage, and my student fit the bill perfectly for an instructor after going through our training. Many practitioners of Thai Massage have a background in yoga. 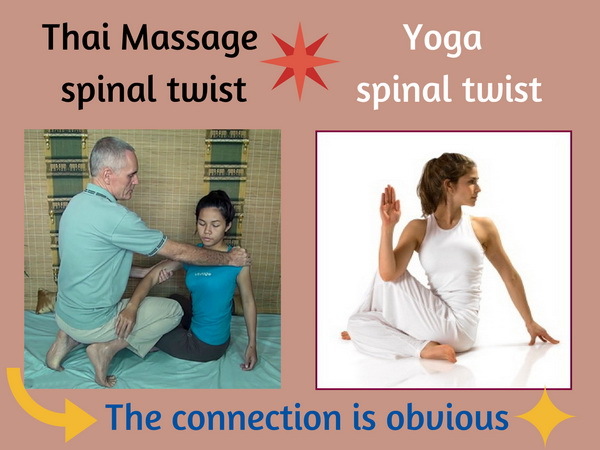 This relationship makes a lot of sense since Thai Massage originally came from the Indian yoga system. There are more and more yoga teachers who have studied Thai Massage. This is an ideal combination since the two systems complement each other in many ways. Actually the majority of the students of Thai Healing Massage Academy are either yoga practitioners or yoga teachers. They often add Thai Massage techniques to their yoga classes which is a much appreciated touch by their students and sets them apart from other yoga teachers. A second way how many yoga teachers use Thai Massage is by offering sessions to their yoga students. They generally use the term “Thai Yoga Massage” in such cases. This is a perfect arrangement since it is the easiest sell in the world to offer an “applied yoga session” to your existing yoga students. This is an additional income stream for the teacher, and it is a service which is highly valued by the students. It’s a marriage made in massage heaven, so to speak. 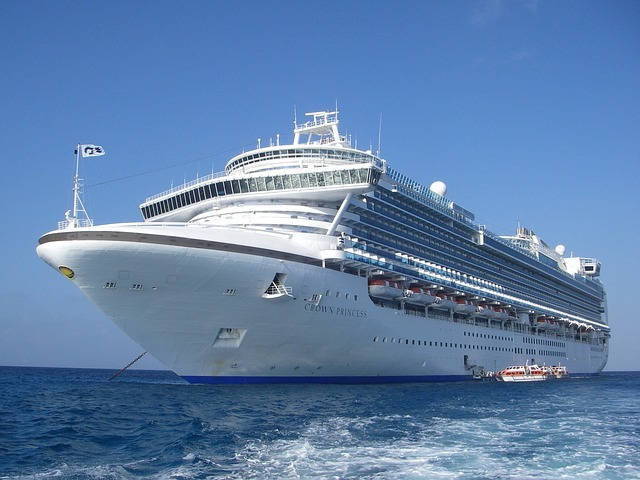 If you have ever been on a cruise you have almost certainly noticed that there was massage on the menu of services. Those massage jobs are a lot less glamorous than the destination spa consultants, but they will get you around the world to many exciting destinations. Here you also have to do your research since some cruise companies will work you to the bone. So find out what the hours are and what is expected from you. How do you find such jobs? Just google “cruise ship massage jobs”, and you will find plenty of opportunities. Now let’s move on to the uses of Thai Massage that are not professional or for the purpose of making money. It can be a hobby – after all, people play tennis or climb rocks as a hobby, so why not learn Thai massage? It is a very useful hobby since you can help many people with aches and pains and stiffness. Or you can use it just to make your friends and family feel good with a great massage. It does not have to be a serious one hour massage session. Even a 15 minute mini session is a great gift and will always be highly appreciated. I know for a fact that many of the students of Thai Healing Massage Academy are using their skills to work on their spouses and children, even very young ones. It can be a great way to deal with some aches and pains instead of reaching for the bottle of aspirin. Here in Thailand it is quite common to see people massaging each other in public. It is also quite common that Thai Massage is being practiced and taught within the family. Can you imagine how much your spouse or partner would appreciate some massage work after a stressful day? Relationships don’t just happen, you have to work on them if you want them to last and to blossom. Partners who work on each other with some Thai Massage skills can add an entirely new dimension to their relationship. It builds trust, appreciation, and counts as real quality time spent with each other that can replace some TV or internet browsing time. How about giving a full Thai Massage session as a birthday present? I know for a fact that this works since my wife and myself massage each other regularly. I can say with certainty that this has been a major factor in the quality of our relationship. Who would not appreciate some great massage after a stressful day? And which spouse would not greatly appreciate their partner for this labor of love? If you don’t want to learn the entire complex Thai Massage training system, Thai Healing Massage Academy offers a perfect alternative. Check out our Massage For Friends And Family home study video training course here. Some people are incredibly creative and combine Thai Massage with partner yoga or even create new modalities like Acro yoga, or flying yoga. Yoga and Thai Massage can be combined in countless ways that can inspire you, increase skill levels and demonstrate the beauty that can be expressed through the human body. 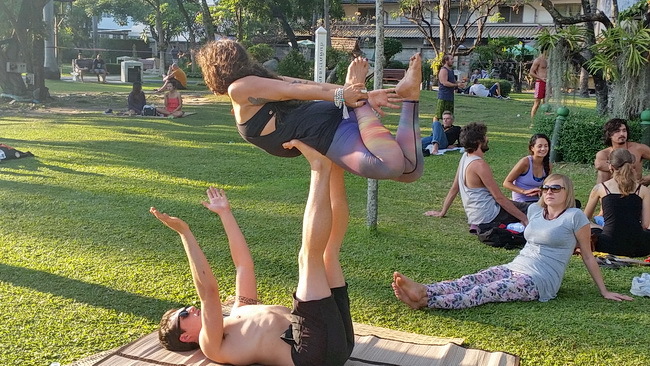 Partner yoga, Thai Massage and Acro (flying) yoga overlap to some degree. They all use elements from each other and blend beautifully. 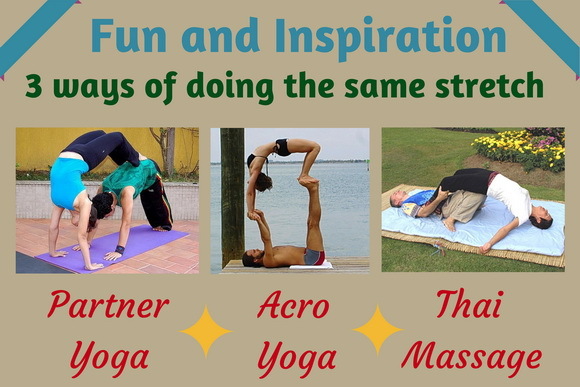 For example all three pictures above show variations of the “bridge”, a posture which is used in all three modalities. In Chiang Mai’s city park here in Thailand there is a lively scene of western Thai Massage students. You can watch dozens of them every day practicing Thai Massage, doing Acro Yoga and Partner Yoga. It looks amazing, graceful and it is obviously a lot of fun. Thai Massage can be learned in live courses, if you live near a good school and have the budget for the course fees. Another option is online video training which is offered by Thai Healing Massage Academy. This option works well if you already have experience with yoga and/or massage. A good way to find out if online training might work for you is to request our free Thai Massage video course. If you think that this article is a keeper, you can download it here in pdf format. RIGHT click, then “save link as”/”save target as”, depending on your browser. The author, Shama Kern, is the founder and director of Thai Healing Massage Academy. 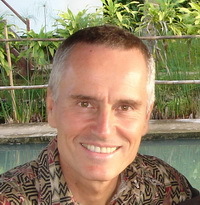 He has been practicing and teaching Thai Massage for 18 years and he is the creator of 20 online Thai Massage video training courses. Thai Yoga Massage Versus Yoga – Which One Is Better? very interesting article and ideas, thanks!!! Wow! Anothe inspiring and encouraging article. Wonderful, you are picking up steam, I wish you all the best with it! Nice, thanks for this stimulating article! That’s wonderfully written. Great thanks. Thank you for the article. I am personally interested in Number 3 “Thai massage consultant” and I was wondering how this would work and ways to go about “presenting” this to spas? Any advice on this topic? Feel free if wanted/need be to respond via my email as well as on this forum. Hi Toni, I just rewrote and greatly expanded this article. If you reread the #3 section, you will now find lots of practical advice there. Thank you for your articles. I hope I can help some people and earn some money as well by doing Thai massage. Excellent article, Shama! I teach Thai Foot Massage and Thai Hot Herbal Compress massage as well as other therapies. Some really good students go away with their new skills and then get a bit lost as they can’t identify how to get working. I try to make helpful suggestions but a ‘third party’ view of getting out there is really useful. One of the issues in the UK is that people think our own vocational qualification system is the be-all and end-all of getting a job – this article makes it clear that it is skills which matter, and using your skills creatively which leads to success. Thank you very much. Thanks Sarah, I am glad that you find the article useful. It’s the same in the US. If therapists have not been abroad, it is hard to see opportunities besides the “normal” way of doing things. Awesome information. Thank you so much for sharing. 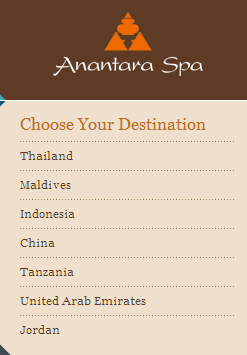 This obviously excludes regular Thai Massage which the spa can easily find local therapists for. Again I made it clear that I am not talking about practicing regular Thai Massage in Thailand in direct competition with the Thais. However I know that there are spas in Thailand and all over the world who are looking for therapists who can offer something unique to their clientele. Such destination spas take care of making sure that all legal requirements are met. To reiterate, I never claimed that foreigners can legally practice Thai Massage in Thailand – which, as you mentioned, would definitely be illegal. 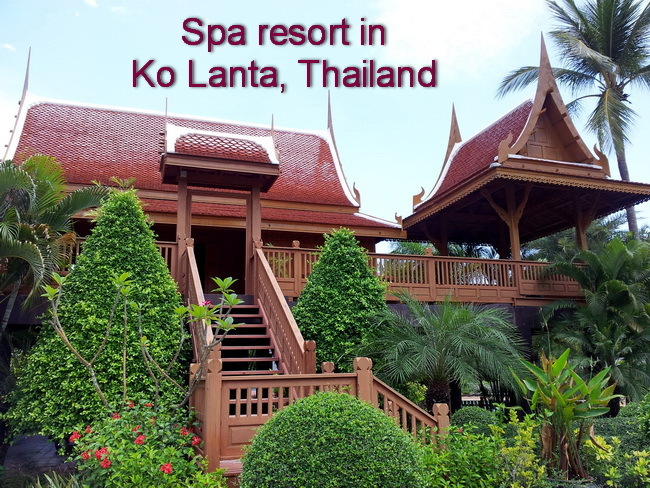 Aside from Thailand, there are many countries where spas and massage establishments are actively searching for Thai Massage therapists, and they do provide work visas. If they don’t provide the proper visas, obviously stay away from those.